DETAILS This is just a teaser for your own creativity. There is so much you can do here. On an 8 1/2 by 11 sheet of paper make a heart template. Make it as big as the paper will allow. If you need to see how to do this, click on Heart Chain. Trace around the template on a sheet of red construction paper. Place two more sheets of red paper underneath, clip together and cut out the heart. You now have three identical hearts. Place them together and punch holes in opposite sides of the V. This is where you will thread the ribbon that will hang the hearts. You want the holes to be in the same place on each heart to make the banner hang properly. Now, if you like, line up the three hearts and punch holes around the edges for decoration. For the letters we played with the fonts on our computer, choosing something fun, enlarging them all the way up to 275. "Valentine" we made smaller to fit. After printing the letters, each on a separate sheet of computer paper, we made heart templates that were large enough to encompass the letters. These we placed UNDER the writing so we could see the outline (it helps to lay this on a dark background) and adjusted the letters to fit. 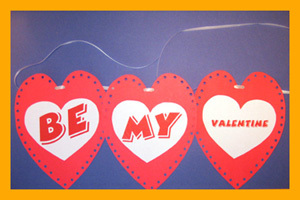 When satisfied, we drew around the heart on the paper with the writing, cut, then glued these white hearts to the red. Using narrow white ribbon left over from Christmas, but string would work too, we threaded the hearts, being sure to leave plenty on both ends for hanging. Alternately you could just write your own letters with colored pencils or markers, that's much easier, but for older children it's fun to explore the computer fonts and learn how the computer can be used in art projects. You could also thread the holes with ribbon or raffia or decorate those white hearts. GO BE CREATIVE. MATERIALS NEEDED Computer, printer, computer paper, construction paper, scissors, hole punch, glue, string or thread.